A scholar models one of the available dresses. 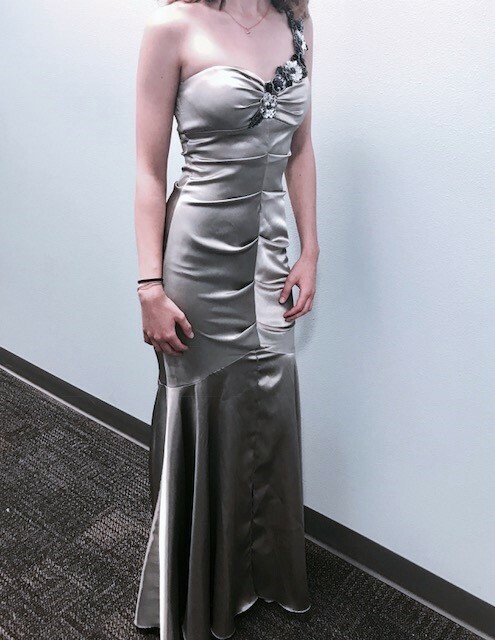 Check out the askcatalyst Instagram to see other dress options – or visit Ms. April’s office. The ASK Academy Prom is just around the corner, and it’s important that the attendees are ready for the big night. There is so much that goes into the night, and the costs can eventually add up to more than many families can afford. Academy Counselor, April Marquez, has set up a quick and cost-free boutique in her office. People from around the city donated gently used dresses, shoes, and men’s attire, and they are currently up for grabs. Most people end up wearing a prom dress once, so there is no sense in spending upwards f $300 on a dress that will get minimum use. Marquez currently has a full rack with dresses in all sizes, lengths, and styles. She also has shoes, and menswear. See April Marquez about prom attire by Friday.